Presteigne St Andrews were enjoying one of their finest-ever runs in the Welsh Cup when they headed to Bangor City for a third-round tie. 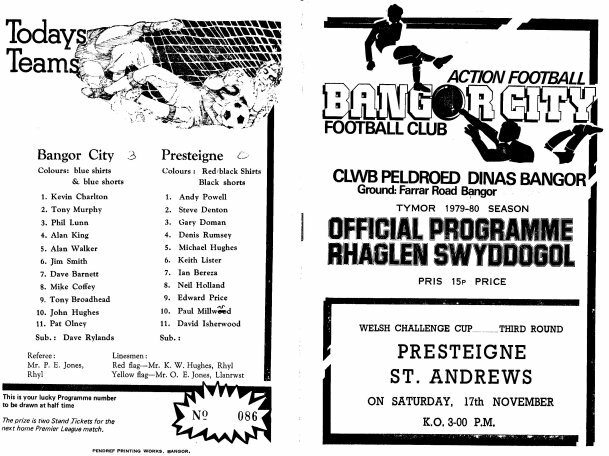 Back in 1979, Bangor City were an Alliance Premier League side – the equivalent of the Blue Square Premier today – so Mike Lockwood’s side was always going to be up against it. They had earned their place at Farrar Road courtesy of wins over two fellow Mid Wales League sides in the previous rounds. Knighton Town were put to the sword 6-2 in the first-round tie at Llanandras Park in which striker Edward Price notched a hat-trick. The draw for round two handed Presteigne another home tie and this time Llanidloes Town were the visitors. In a much closer affair, Edward Price was again to steal the headlines as he netted both Presteigne goals in a 2-1 victory. Manager Mike Lockwood – universally known within local football both then and now as ‘Nobby’ – recalls the size of the task facing his side as they prepared to head to the Alliance Premier League club in round three. “They were obviously a very good side as they were playing in the top level of non league football so we were always going to be up against it,” he said. “Then there was their pitch which was weird – there was a slope across it that meant the one wing was at least four feet higher than the other. “It was like playing at Lord’s Cricket ground and we had problems playing off the bank,” he added. Despite the odds being against Presteigne – especially when they fell behind after only seven minutes – they were to put up a tremendous performance before finally going down 3-0, with the home team’s other two goals coming in the final few minutes of the match. Goalkeeper Andy Powell further enhanced his reputation with a series of fine saves, especially as he picked up a knock shortly before half time and carried that injury throughout the second period. The Bangor side contained no fewer than seven players with Football League experience, but Presteigne’s excellent defensive effort kept them out until the final five minutes of the game when two quick goals sealed Bangor’s place in the fourth round. 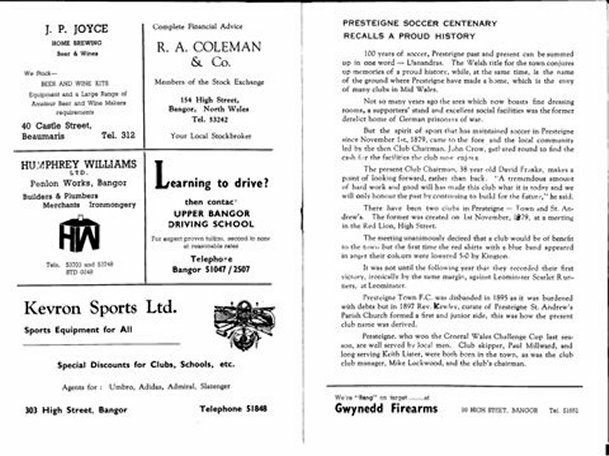 30 years on, Nobby Lockwood still has fond memories of the day and speaks proudly of the achievement of his side that gave Bangor a serious run for its money. “The whole team was excellent and we put up a really good showing against a top Bangor side,” he said. “They came down to our place a couple of years later with much the same side and we pushed them close again before they won 2-0 at Llanandras Park. “The only reason we entered the Welsh Cup at that time was to get money for the club,” he admitted. “It was hard work managing those lads but they were really good players. “I came along at just the right time and it was my job to go out and get the players and luckily for me they came along at the right time too,” he added. This final whistle and the standing ovation from the crowd of more than 500 should, perhaps, have been the end of the story, but Mike Lockwood said there was much more to their day out in north Wales than just the game. The club had pushed the boat out by booking a minibus to take the team to Bangor for the tie and, in the true traditions of local football, the players decided a few drinks were in order before making the long trip back. When they returned to the rendez-vous point with the minibus, they found it had left with the driver later claiming they had not been there on time – something Mike Lockwood disputes to this day. “We were where we were supposed to be, but the story afterwards was that the driver had a big dominoes tournament he wanted to play in, so he left us there,” he laughed. “We were stranded in Bangor and we had to wait for the minibus owner to come and get us. “I think some of the lads had three or four Indian meals and about six bottles of lager each while we were waiting. “Then we decided to have a game of football with a tin outside the College until the Police turned up,” he added. Among the club officials who faced picking up the bill for two minibuses was David ‘Taffy’ Freake who was then the local bookmaker and who remembers the day for a different reason. 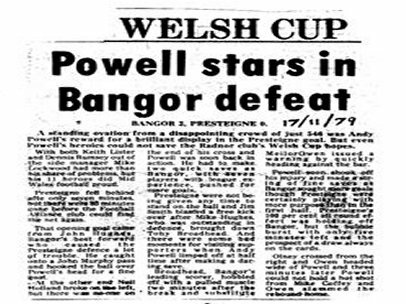 Presteigne’s 1979-80 squad did itself proud at Farrar Road, but their Welsh Cup battles with Bangor City were not to end there for the sides met again the following season in a fourth-round tie at Llanandras Park in which Bangor were 2-0 victors. Below is the match report as printed in the Mid Wales Journal (and reproduced with their kind permission), while there is a transcript for those struggling with the dated text! ‘A standing ovation from a disappointing crowd of 544 was Andy Powell’s reward for a brilliant display in the Presteigne goal. 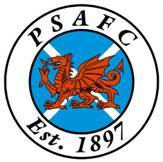 But even Powell’s heroics could not save the Radnor club’s Welsh Cup hopes. With both Keith Lister and Dennis Rumsey out of the side manager Mike Lockwood had more than his share of problems but his 11 heroes did Mid Wales football proud. Presteigne fell behind after only seven minutes, but there were  minutes gone before the Football Alliance side could find the net again. That opening goal came from John Hughes, Bangor’s best forward, who caused the Presteigne defence a lot of trouble. He caught on to a John Murphy pass and hooked the ball over Powell’s head for a fine goal. At the other end Neil Holland broke on the left but no-one got on the end of his cross and Powell was soon back in action. He had to make two quick saves as Bangor, with seven players with league experience, pushed for more goals. Presteigne were not being given any time to stand on the ball and Jim Smith blasted a free kick over after Mike Hughes, who was outstanding in defence, brought down Tony Broadhead. And there were some bad moments for visiting supporters when Andy Powell limped off at half-time after making a daring save. Broadhead, Bangor’s leading scorer, hobbled off with a pulled muscle two minutes after the break and substitute Meilor Owen issued a quick warning by heading against the bar. Powell soon shook off his injury and made a string of fine saves as Bangor sought more goals. Presteigne were certainly playing with more purpose than in the first half. Presteigne’s 100 percent all round effort was holding off Bangor but the bubble burst with only five minutes left and the prospect of a draw always on the cards. We are especially keen to hear from either those who played in the game, or who went up to Farrar Road to watch the match as we would welcome the chance to add your memories of the day into this article. If you were there, then please send an email and we will gladly include your thoughts.